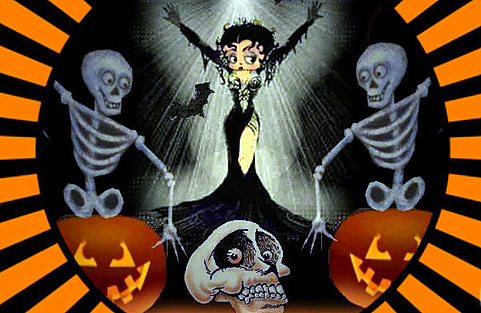 For the last Wacky Wednesday before Halloween, here's a Betty Boop at her spooky best. Mysterious Mose, released in December 1930 was one of Betty's first appearances and it's a fright-filled doozy. She literally gets scared out of her nightshirt by strange noises in the night. Notice that in this one she still has dog ears. Betty started out as a strange Poddle/woman hybrid. Finally here's Betty at her own Halloween party.